[caption id="" align="aligncenter" width="500"] Lee Seung Gi, actor at My Girl is a Gumiho. The Saem is a new Korean cosmetic brand set up in the year of 2010. The Saem was developed by the technology of fifty years from a major company,”Korean cosmetic”. The name of The Saem means “the spring water(Saem) of beauty” that contains the wisdom of beauty. The Saem picked Lee Seung-Gi as its model who is a popular actor and singer both in Korea and Japan. ‘O2 Bubble Mask,’ which was all sold out after its release, is a very popular product. To be fully honest, it is hard to find the information about this brand. Mostly are written in Korea, and I can't read even single letter LOL. This mask sheet cotains pure moisturizing energy of the pristine New Zealand Harakeke! 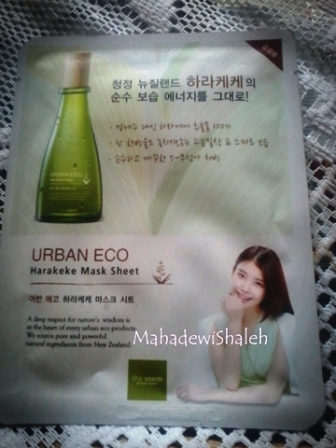 This nourshing treatment mask sheet supplies moiture fast and conveniently to the skin. Before using this mask sheet, I used Sulwhasoo Herbal Soap, The History of Whoo Whitening Soft Toner and The History of Whoo Brightening Gel (as my weekly skincare regime). When I teared the plastic packaging I tried to smell it, how good it smells? Why? Because if it has a good smell it will give you extra comforting experience of masking. After that I check out how thick is the cotton sheet of the mask. AND oh laa laa, it is so thin, not as thin as My Beauty Diary mask but it is thin enough and somehow I love it! After that, I checked out the essence, and it has so much essence so I can apply it on my neck and rub it to my hands LOL. After using the mask for an hour (I never remove mask less than an hour :P) I gently tap the excess essence to my face and unfortunately it feels so sticky. So I put my towel to remove the stickiness feeling. After that I continue to do my day skincare regime. Surprisingly, after using this mask sheet for hours, I expect some dullness, and excessive oil on my face (because the stickiness felling before), BUT VOILA, it leaves my skin as bright as usual but with more moisturized and supple skin. IT has done its job nicely. Repurchase? YES, waiting for another sale. But I want to try other products from the Saem. Recomended? If you can handle the sticky felling give a try! Well, the only weakness of this mask sheet is the stickiness after removing the sheet. The rest aspects from the mask nicely done the job.